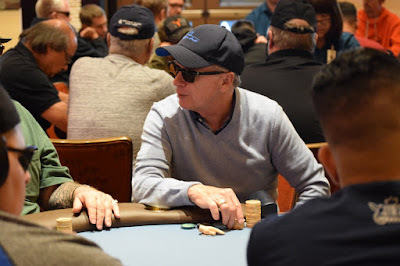 Day 1B - Henry Gurnick was the recipient of two stacks early in Day 1B - the boat-over-boat-over-flush hand we detailed a few posts back. A player with just 1,600 chips remaining moves all in and Gurnick (above) calls with AJ, seeing he is ahead of his challenger's KJ. The turn, however, is a King and the short stack survives.